In late 2018 Zero Invasive Predators (ZIP) ran a series of behavioural trials with kea housed at Willowbank Wildlife Reserve, which found that cereal baits containing the repellent anthraquinone at a concentration of 2.7% by weight can significantly reduce consumption of cereal baits by kea during subsequent exposures. This trial was published on our website as both a Finding and more detailed Technical Report. The promising results of these trials led us to begin developing a plan to use anthraquinone-laced cereal baits to reduce the potential risk to kea during our upcoming predator removal operation in the Perth River valley. If any possums or rats in the operational area also develop an aversion to cereal baits, this would likely compromise the effectiveness of the predator removal operation. Therefore, the implementation plan for the operation may require methodology to expose kea to the repellent, but not the target predators. Anthraquinone is known to reduce consumption of baits by rats, but little evidence exists to suggest whether or not this is also true of possums (Clapperton et al. 2015). To inform the implementation of our kea risk mitigation plan, we ran some behavioural trials in January 2019 with captive possums at our Lincoln Predator Behaviour Facility, to determine whether exposing possums to anthraquinone-laced cereal baits can result in aversion to cereal baits. ZIP carried out behavioural trials with five captive brushtail possums (Trichosurus vulpecula) housed at the Lincoln Predator Behaviour Facility. Each possum was provided with 200g of cereal bait during four 24-hour sessions over a 12 day period, as outlined in the table below. One individual (Possum 5, Female) died of natural causes on the 18th of January, so was not subject to the final session. The bait pellets were left overnight for the possums to consume freely. The following day all remaining pellets and fragments were collected, dried, and weighed to determine total consumption (g). On session days, individuals were fed a restricted diet (1/4 apple and water only). Normal feeding resumed between sessions, but possums were not supplied with pellet food for the duration of the trial period. Consumption by individual possums of the standard non-toxic Wanganui #7 baits initially ranged between 20g and 85g. Consumption generally decreased during the second and third – i.e. repellent-laced – sessions (Figure 1). During the second anthraquinone treatment (session 3), all subjects consumed ≤ 4g of bait. In the final session (session 4; standard non-toxic bait) three individuals consumed ≤ 1g of bait, indicating a learned aversion to the Wanganui #7 bait. One individual, however, does not appear to have acquired this aversion and consumed bait at a rate more comparable to the pre-repellent control (Possum 4). Results from this preliminary trial indicate that exposure to cereal bait laced with 2.7% anthraquinone can reduce consumption of cereal baits by possums upon immediate subsequent presentation. After two sessions of exposure to anthraquinone, three of four possums did not consume Wanganui #7 bait at a rate that would be sufficient to cause death during a toxic operation. One individual consumed 52g of bait during the final feeding session, which indicates that the adverse association was either not learned, or was forgotten within the trial period. At this rate of learned aversion, even with a very small sample (3 out of 4 possums), the object of the Perth River valley operation – i.e. to completely remove every possum – would likely be compromised. The aversion behaviour observed in this trial appears to be at odds with Clapperton et al. (2014; 2015), who noted no decrease in the efficacy of possum control operations following possums’ exposure to anthraquinone. 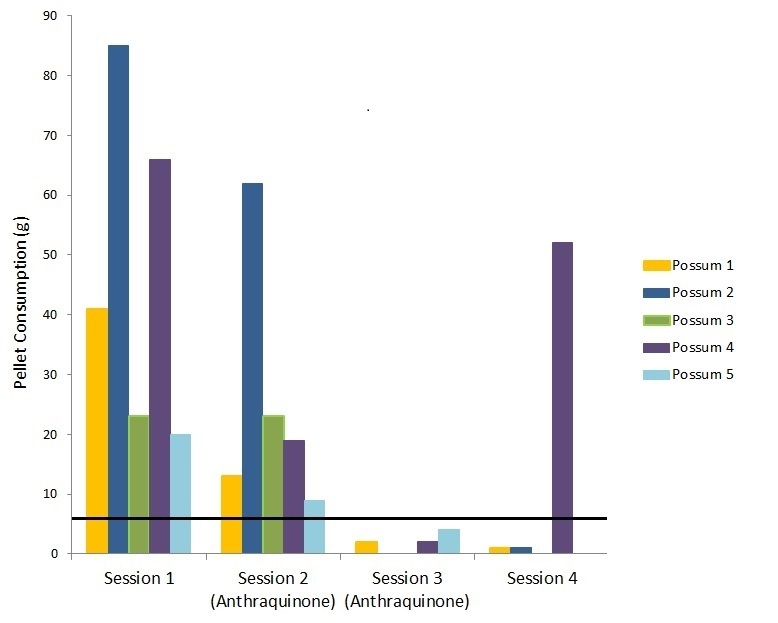 This difference in result is possibly attributable to the fact that the 2.7% concentration of anthraquinone used in our trial is much higher than that used in previous possum efficacy trials (<1%) (Clapperton et al. 2014; 2015; Cowan et al. 2015). While we did not record observations of possum behaviour following consumption of anthraquinone-laced baits, the subsequent decline in consumption suggests that this higher concentration will have generated repellent effects (i.e. gut irritation). It is not known how long this learned aversion would last for possums. Efficacy of control was assessed 21 days and 7 days after anthraquinone exposure in the Clapperton et al. (2014) and (2015) trials respectively – in contrast with the two day period between feeding sessions in our trial (which mimics the intended baiting deployment in the Perth River valley). What does this mean for the Perth River valley predator removal operation? This study demonstrated that exposure to cereal baits containing 2.7% anthraquinone can result in bait-aversion in possums. If anthraquinone-laced baits are sown within the operational area, or in an area where possums are present, this could compromise the effectiveness of the predator removal operation. As a result, ZIP will need to ensure that bird repellent baits are only used outside the boundary of the operational area, where kea are present, in order to minimise exposure of the bait to possums or rats. This trial was carried out by our Lincoln Predator Behaviour Team, and this Finding was written by Jenny Dent, ZIP’s 2018-19 Michael Taylor Conservation Intern. The Michael Taylor Conservation Internship is made possible through the generosity of the Tararua Tramping Club - thank you to the club for supporting our work! Susannah Aitken and Phil Bell reviewed an earlier draft of this Finding. Clapperton BK, Morgan DKJ, Day TD, Oates KE, Beath AM, Matthews LR (2014) Efficacy of bird repellents at deterring North Island robins (Petroica australis longipes) and tomtits (P. macrocephala toitoi) from baits. New Zealand Journal of Ecology 38: 116–123. Clapperton BK, Day TD, Morgan DKJ, Huddart F, Cox N, Matthews LR (2015) Palatability and efficacy to possums and rats of pest control baits containing bird repellents. New Zealand Journal of Zoology 42: 104-118. Cowan P, Brown S, Forrester G, Booth L, Crowell M (2015) Bird-repellent effects on bait efficacy for control of invasive mammal pests. Pest Management Science 71: 1075-1081. Veltman CJ, Pinder DN (2001) Brushtail possum mortality and ambient temperatures following aerial poisoning using 1080. The Journal of Wildlife Management 65: 476-481.